NOTE: Pax Christi USA has signed onto this effort. Our lives, our votes, our jobs, and our schools matter. These are more than words. More than a tagline. They are the reason we embarked on America’s Journey for Justice yesterday—an 860-mile march from Selma, Alabama, to Washington, D.C. They are the guiding principles for our activism. Racial inequality is not simply the product of individual prejudice. Over the past 250 years it has been written into our laws and into the very fabric of our society. We need your support to ensure this journey results in more than raised awareness. It must result in real positive change. Send a message to lawmakers: We won’t be ignored. 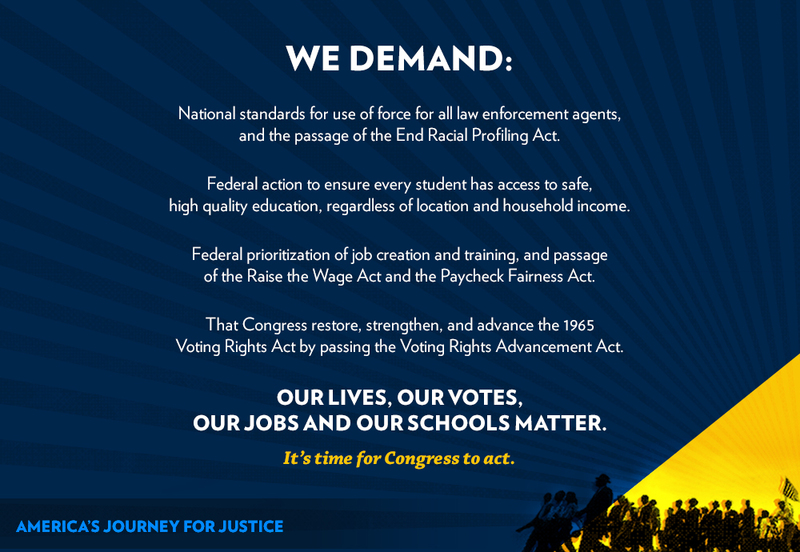 Sign and share our advocacy agenda to support America’s Journey for Justice.